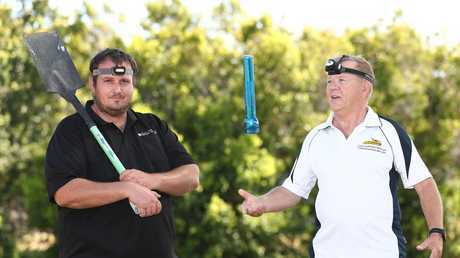 DON'T be alarmed if you see bands of people hunting in the dark with torches, shovels, baseball bats and big sticks this weekend. They're not coming to rob you, they're after cane toads. 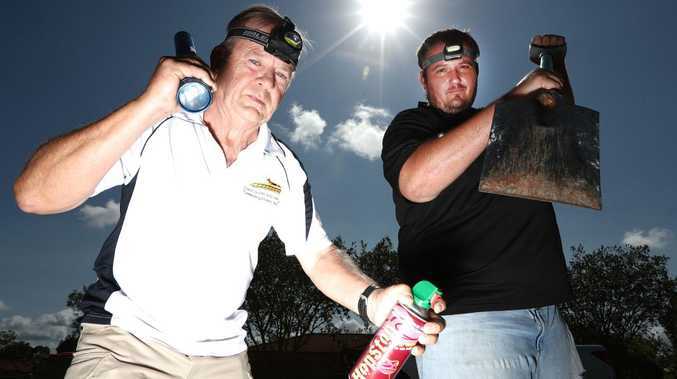 Varsity Lakes resident David Nestor and his neighbours are out for blood on Saturday night as they embark on a cane toad cull. Mr Nestor said the area had seen an explosion of the invasive amphibians, one of which had caused the death of his beloved pet. "Our 11-month-old puppy Lucy swallowed a small cane toad, suffered greatly for a few minutes and sadly died in my arms," he said. "This year in particular there have been a lot more than usual and we've heard from locals going to the dog park that there's been a large increase in the number of dogs that have licked, chewed or swallowed cane toads." Another resident, John Beyea sparked the hunt after his dog almost died when it chewed a toad. In the past two weeks Mr Beyea said he had killed 76 cane toads from four properties. Mr Nestor said he expected up to 100 people to join the hunt. "The event officers at Queensland Police said things like this can attract large numbers and that we might even have 600 people joining," he said. The group will meet at 6.30pm at Frascott Park before fanning out from 7-10pm. 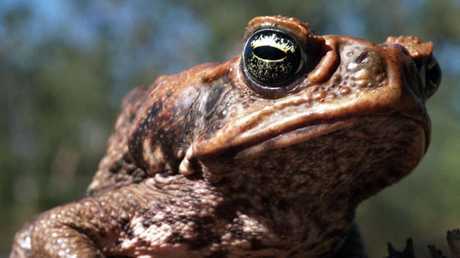 The Department of Agriculture and Fisheries said cane toads were not declared as pests in Queensland, meaning there was no legal requirement to control them. But they are an invasive species and while not prohibited and not falling under the Biosecurity Act, councils were required to have a plan. The Gold Coast City Council lists cane toads as low priority on their draft biosecurity management plan. It says it is not required to enforce regulations, but it can assist people in addressing the problem. Mr Beyea said he contacted the council but did not receive assistance. 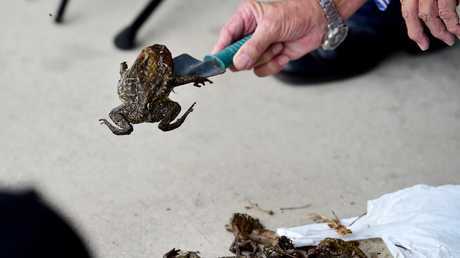 Senior Vet at Currumbin Wildlife Hospital Michael Pyne said cane toads were detrimental to pets and native wildlife. "They're a massive threat to other animals - anything that eats cane toads dies," he said. "They're a big threat to carnivorous animals, certainly snakes and lace monitors in this area. They've been a massive environmental catastrophe." Mr Pyne said he applauded the community for stepping up but encouraged humane action. "I've got no problems with people collecting them. For the average person there's no ideal way, but options are (aerosol spray) HopStop - they don't enjoy it but it could be used or cool them down in a fridge until they're asleep, then transfer to a freezer. Neither are ideal, but they're better than physical trauma," he said. A generic picture of a cane toad. Dr Justin Ward at Reedy Creek Veterinary Service said people needed to act fast to save their pet after coming into contact with cane toads. "Dogs tend to lick the toads or grab them so the toxins get in their mouths. Initially it's an irritant and their gums go bright red and they drool a lot, which happens very quickly," he said. "If you wash the dog's mouth out in timely fashion they should be fine. "If this doesn't happen the toxins will be absorbed into the bloodstream and cause serious symptoms like seizures, abnormal heart rates and in serious cases death."